Kayak safety begins with prevention, which is achieved primarily through improved stability, a higher free-board, and the ability of the passengers to balance themselves more effectively. Only an S4 is capable of negotiating these passages at this speed. But, I can take a wrong turn or two, too. 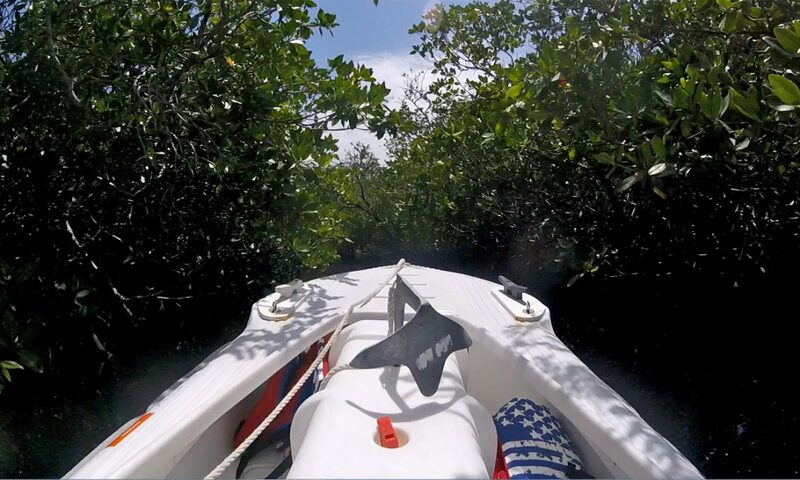 DON’T TRY THIS YOURSELF BECAUSE IT’S HAZARDOUS – THERE IS NO ROOM FOR ERROR IN THOSE TIGHT AND WINDING MANGROVE TUNNELS, AND BUMPING INTO A MANGROVE TREE OR BRANCH CAN RESULT IN SEVERE INJURIES, AND DROWNING. Captain Larry Jarboe is a Master Captain and seasoned fishing guide who drives through mangrove tunnels on a daily basis. His professional skill level is the result of years of studies and practical experience, and a lot of caution. 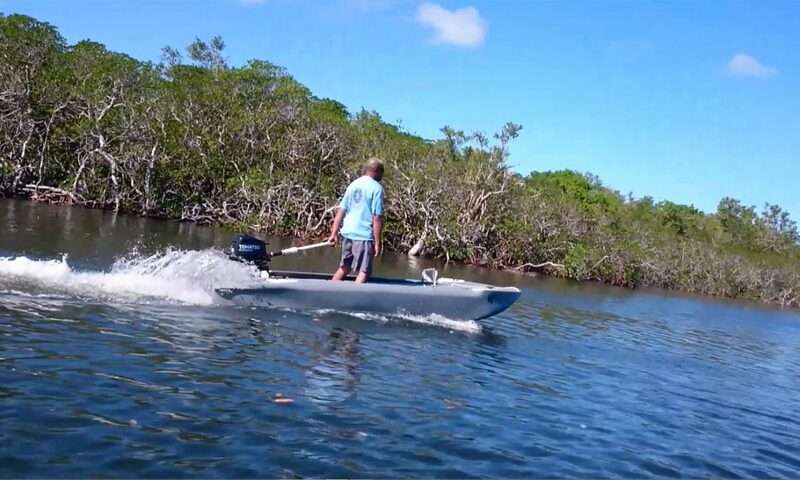 As much as the S4 is a very responsive skiff, where it goes depends on the driver, and the last thing you want to happen is a mangrove branch hitting you in the face, or poking you in the eye. Such accidents do happen in these places, unfortunately. Please be watchful and very careful when driving through any kind of vegetation, and even near vegetation. A tree limb protruding from the river bank, and even a sunken tree trunk or a tree stump can be dangerous, and cause an accident. This article examines issues related to the seaworthiness of kayaks in general, including fishing kayaks, and of sea kayaks in particular, and it discusses an alternative approach to sea kayak seaworthiness based on the new W Kayak concept, and on micronautics – the art and science of designing watercraft that are small and lightweight enough to be affected by the size and movements of one passenger. 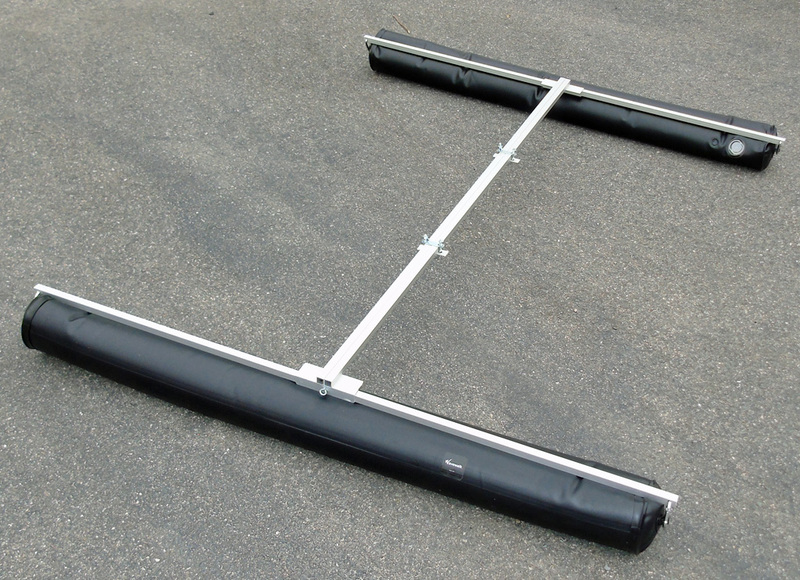 The reader is encouraged to watch online videos demonstrating performance of 11 ft long W500 kayaks. The subjects discussed here include launching, going over and through incoming waves, going over lateral waves and playing with them, surfing and paddling standing at sea, and tracking in strong wind. Touring and sea kayaking were the two first kayaking applications outside the traditional use of kayaks by native people of the arctic zone. Nevertheless, after many decades these activities are still practiced by a small minority of kayakers whose number has been declining in recent years while recreational kayaking has become widely popular and dominates the kayaking scene in terms of participation and number of boats sold. sea kayaks are faster than recreational kayaks, and paddling in the open ocean and in the surf is certainly more exciting and challenging than ‘recreational’ paddling. Also, younger generations are naturally attracted to speed and more exciting outdoor sports, so why is the number of sea kayakers small and decreasing? Polyethylene sea kayaks are not much more expensive than the better recreational kayaks, and are for the most part equivalent in performance to FRP (Fiber Reinforced Plastics) sea kayaks, so we’ll rule cost as a valid explanation. It seems that in order to answer this question we’ll have to first determine what’s a ‘sea kayak’ vs. ‘recreational kayak’: A sea kayak is a long, narrow, traditional sit-in kayak (SIK) in which the paddler sits while being protected by a spray skirt, while a recreational kayak is either a SIK or a sit-on-top (SOT) kayak that’s wider (up to 42″ wide) and stabler, where the passengers are not protected by spray skirts. Modern, commercial sea kayaks differ from the native kayaks by the fact they are all equipped with seats and foot braces, and in many cases rudders too. Since recreational kayaks are slower than sea kayaks they also have a more limited range of operation, and since they offer little or no protection to their passengers they are generally limited to more warm and flat waters. But are sea kayaks really seaworthy, and if indeed they are why do the overwhelming majority of kayakers prefer recreational kayaks? If sea kayaks were indeed seaworthy shouldn’t we expect most kayakers, or at least a bigger number of kayakers to adopt sea kayaking as an outdoor sports activity? Apparently, the vast majority of kayakers do not perceive the narrow sea kayak to be seaworthy although it offers superior speed and is constantly advertised as being the true and ultimate kayak. Sea kayakers are likely to find this incomprehensible, but to most people the idea of being trapped in a narrow and unstable boat that offers the ‘Eskimo Roll’ as an only safety option is perceived as similar to being handcuffed to a motorcycle that has no breaks: It’s an equivalent to a death trap. Interestingly, the number of people who practice board surfing is many times bigger that the number of surf kayakers, which is extremely small. This means that under similar conditions surfers prefer a board to a kayak that requires both a spray skirt and a helmet. Are the majority of kayakers right about this? Is the saying ‘Vox Populi Vox Dei’ valid in this case? This article will attempt to examine the seaworthiness of sea kayaks from a number of angles. Indeed, this is a most seaworthy definition! There can be a number of answers starting from sailing crafts to inflatable rescue boats, but all these examples would have one thing in common: their stability, and more specifically – lateral stability. Why? -Simply because all boats are narrower than they are long, and therefore small boats are particularly narrow, that is highly unstable and prone to capsize. The ways to deal with this problem are multiple, from weighted keels in sailing boats to very wide beams in traditional ‘cats’, rescue boats and some big canoes, but these solutions are not applicable in kayaks. Kayaks belong to a group of watercraft that are just a little wider than their passengers, and weigh even less than them. We like to call the field of nautical design of such very small boats ‘micronautics’. Sea kayaks are faster than most paddle crafts and speed is a good thing in terms of seaworthiness: Slow kayaks that are hard to paddle expose their users to fatigue and could make it difficult or in some cases even impossible for them reach to their destination under unfavorable weather and/or water conditions. But the sea kayak is a singularity in the micronautical world since it is the only seafaring boat that offers less lateral stability than what is required to maintain balance without constant, active intervention from the passenger/s. This puts the sea kayak in an extreme position – that of offering little or no static (form) means to prevent capsizing. In practical terms it is a watercraft designed to capsize. sea kayakers might find this definition somehow harsh, and point to the fact that sea kayaks are designed to be rolled and not to be capsized. The problem with this argument is that rolling is not a prevention strategy but a recovery strategy. In safety terms sea kayaks simply don’t offer considerable means of prevention other than their passengers’ skill in balancing the boat, and therefore are seen as unsafe – a term that’s is commonly perceived as the equivalent of ‘not seaworthy’. -Derek Hutchinson ‘The Complete Book of Sea Kayaking’ (1995.. Old Saybrook, Conn.: The Globe Pequot Press, Inc., p.166). 3. Native peoples’ kayaks were never equipped with a seat while all present-day sea kayaks are. This makes the latter both less stable and more difficult to roll than native kayaks. On top of this, the average contemporary North American sea kayaker is significantly taller and heavier than the average native arctic kayaker was, a fact that further reduces the sea kayak’s safety from both stability and rolling perspectives. 4. For the vast majority of modern paddlers the Eskimo roll is impossible to practice and therefore not a safe option. In fact, even seasoned sea kayakers can ‘miss their roll’, especially in emergency situations: It’s one thing to roll your kayak in a pool with nose plugs on and the water around you perfectly still, and quite another thing to roll it in the surf after you’ve been slammed by a breaking wave and hit the bottom with your head There are countless accounts of experienced sea kayakers who occasionally ‘missed their roll’, which indicates that the common perception of the Eskimo roll as being unreliable is anchored in reality. 5. Over the years sea kayakers and sea kayak designers have developed a ‘sea kayaking philosophy’ that seems to have turned things around: The highly undesirable situation in which you are trapped inside a narrow and unstable boat that you can’t even hold straight without keeping your paddle in the water has become justified by the glorification of an extreme, dangerous and unreliable recovery technique that requires endless, tedious practicing that wouldn’t even guarantee results in real life conditions. “For long trips the umiak, and more recently the whaleboat, are used“. Hawkes, E.W. 1916. The Labrador Eskimo. Canada, Department of Mines, Geological Survey, No. 14, Anthropological Series, pp.71-73. “The other type of aboriginal boat, the kayak, was used by the men for short trips and for hunting“. Taylor, Garth. Labrador Eskimo Settlements of the Early Contact Period. Publications in Ethnology. No.9. Ottawa: National Museum of Man. 1974. pp. 39-40. We conclude from these data that most native kayakers were well aware of their kayaks’ limited seaworthiness. The exception of the Greenlanders can be explained simply by the fact that extreme climatic conditions forced these people to stretch the use of their kayaks and rely more heavily on them. We found this sentence and similar ones in a number of sea kayaking websites. Is it any wonder that sea kayaking has not grown to be a widely popular sport and has been continuously receding in recent years while recreational paddling in stable kayaks is popular and still increasing in popularity? Unfortunately, some sea kayakers don’t perceive people who paddle other types of kayaks (e.g. recreational, SOT, W) as ‘real kayakers’ since they don’t roll their boats. These sea kayakers erroneously identify rolling with kayaking and vice versa. Unfortunately, so far such attitude seems to have resulted in further alienation of the broad public from sea kayaking. Pitching is the vertical rotation of the boat around its center of gravity (CG). Pitching causes significant increase in residual resistance (Rr), especially when the kayak goes through waves – The longer the kayak the greater the loss of energy because of pitching. All mono-hull kayaks are constrained by the need to place the paddler in a fixed position in the center part of the hull’s longitudinal axis. This puts a strict limitation on the kayaker’s ability to control his boat’s pitching. However this constraint is nonexistent in W kayaks where the kayaker is free to travel forward and backward along the longitudinal saddle inside the cockpit and thus distribute his/her weight ad hoc where it is likely to be more needed in a proactive manner. For example, when facing waves coming from the direction of the bow it is highly advantageous to place yourself at the back of the cockpit and thus lift the bow. This would not only be helpful for riding up the wave instead of smashing right into it, but also in reducing the impact and loss of momentum when descending on its other side. Rocker is a must in monohull sea kayaks since without it the boat won’t turn well. But rocker also decreases the monohull sea kayak’s ability to track, and therefore its potential speed and by that its seaworthiness since speed is a good thing to have in terms of seaworthiness. W kayaks can turn effectively by having the W kayaker lean into the turn, which means That W hulls don’t necessarily need not be curved vertically to offer rocker. This, among other reasons enables W kayaks to perform the impossible in terms of monohull kayaks, which is to both track and turn very well and without requiring a rudder, which is a considerable source of drag and added complexity in operation. Monohull sea kayaks are designed for speed and for rolling. These two requirements make them very narrow below and above waterline, and therefore lacking in both primary and secondary stability. There is no way a monohull kayak can be fast if it is wide. The first production W kayak (a.k.a. W300 series) was 25″ wide, and each of its hulls has a waterline beam (WB) of 6″ when the boat is loaded with 200 lb. The W500, which is the second generation of W kayaks is 29″ wide, and each of its hulls is 8″ wide. Most kayakers are impressed with this W kayak’s unmatched primary and secondary stability, which allow for a 200 lb man to stand up in it as well as jump up and down and from one leg to another (see demo videos). Monohull kayaks, including sea-kayaks track extremely poorly in currents and under strong wing, a factor that gravely reduces their seaworthiness. For this reason, nearly all sea kayaks come outfitted with rudders or skegs, which help their users track at a price of additional, unwanted drag that slows them down. Wavewalk’s twin-hull kayaks are different since they require to be outfitted with neither rudders nor skegs. A W kayak can track better in strong wind thanks to its two thin, parallel hulls, and the fact that their user can easily relocate the kayak’s center of gravity (CG) for and aft along the saddle, thus determining whether the kayak would point into the wind or away from it, and by how much. On top of this, sea kayaks generally offer a very limited storage space so that sea kayakers often find themselves obliged to attach gear on top of their boats. This is bad for stability and not particularly good for the gear itself. W kayaks don’t present these problems since their hulls can have a straight bottom and even an eleven feet long Wavewalk™ 500 Kayak offers far more protected storage space than the biggest ‘expedition’ sea kayak does. And last but not least, hatches are prone to let water in not only when the kayak is overturned but also in wavy sea, when water flows over the deck. This is not just a storage problem but can also quickly become one of speed and maintaining proper control over the boat. Unfortunately, most of us don’t look like we would have wanted to look, and most monohull sea kayaks are not 18″ wide as sea kayakers would have liked them to be for speed sake. In fact, most sea kayaks are wider simply because even for experienced and dedicated sea kayakers the narrowest monohulls are too unstable for practical purposes. To make a long story short, stability is desirable in sea kayaks as in all other boats – big or small. The problem with monohull designs is that they can’t be made both stable and fast since one has to come on account of the other. This constraint of speed vs. stability is nonexistent in catamaran (twinhull) designs, and since W Kayaks have twin hulls they can be made to be both very stable and very fast. 1. sea kayakers who are willing to give up their reliance on the Eskimo roll for a very stable kayak would be able to do so without having to give up the speed that is so dear to them. 2. More important is the fact recreational kayakers wanting to go on longer trips and paddle faster without giving up the higher stability they are used to could do so and paddle W sea kayaks that are as fast as ordinary (monohull) sea kayaks and offer a higher level of stability than recreational kayaks do. Seaworthiness and comfort are two terms which are closely linked. An uncomfortable sea kayak is dangerous as its paddler might develop fatigue, leg numbness, cramps and back pains that could put him in jeopardy and create a severe problem for other paddlers in the group. The reason why present-day kayaks are equipped with seats and foot braces is because unlike native kayakers, present-day kayakers are unable to sit and paddle in the L position without support for their backs and feet. These support elements known as ‘seat’ or ‘lumbar support’ and ‘foot braces’ or ‘foot rests’ are the source of various ergonomic problems that directly affect safety and therefore are strongly related to seaworthiness. sea kayaks are particularly narrow and offer no way for the passengers to change or even modify their sitting position in case a problem develops while paddling. Consequently, the overall seaworthiness of present day sea kayaks is being further reduced. These poor ergonomics typical to monohull sea kayaks are in contrast with the ergonomic solution offered by W Kayaks, which includes a number of interchangeable comfortable positions. Kayaking biomechanics and ergonomics are discussed in detail in another article on this website. Some sea kayakers erroneously believe that shorter paddles offer a better bio-mechanical solution and therefore the longer, 9 ft paddle commonly used in W Kayaks are less ergonomic. Since this issue relates to propulsion efficiency and fatigue it belongs to this article’s subject. Hawkes, E.W. 1916. ‘The Labrador Eskimo’. Canada, Department of Mines, Geological Survey, No. 14, Anthropological Series, pp.71-73. ‘The Seaworthy Kayak’, article by John Winters. ‘Making a West Greenland Paddle’ Article by Chuck Hols. ‘Greenland Style Paddle Building’ Article by George Ellis.